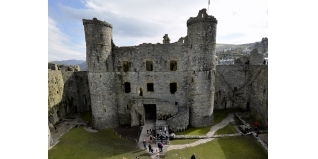 Good weather, a fantastic group of competitors and a 13th Century Castle for the finish – it doesn't get much better as Harlech Triathlon celebrated its 15th Birthday. Over 350 competitors took part in the day's events, which included the Triathlon (400m swim, 21k bike, 6k run), Duathlon (5k run, 21k bike, 2.4k) and 3k Fun Run. As always, scores of volunteers ensured that the competitors had a safe and enjoyable race. "Can I say a huge thank you to all the organisers and marshals for yesterday's amazing triathlon. Finishing in the castle was quite an experience and it was brilliant for supporters to be allowed in to cheer folk on that final push. Can I also say that the fact there were three events running on the day felt like the whole town came alive and it was lovely to see all the kids and runners doing the fun run. Keep up the good work and I'm already looking forward to 2017"
Special thanks go to CADW and Tony Payne, the Castle's Custodian, for allowing Harlech Triathlon Club to use the Castle. The events are run by volunteers for the benefit of the community. Over the years Harlech Triathlon Club has donated over fifteen thousand pounds. The competitors' family and friends had free access to the Castle to cheer them on as they climbed the steps to the finish. The spectator area on the middle ward provided the perfect viewing point. As well as the run it provided a bird's eye view of transition, the run up Beach Road and those starting and finishing the bike. Harlech hosted the Welsh Duathlon Championships. The photo shows the winning woman Jasmine Bowyer, who lives in Harlech.